As much as I wish it were truly fall in Texas, the 100 degree temperatures remind me that it’s just not so. Since I can’t bring out the fall wardrobe, at least I can bring out some delicious fall recipes. I really love the flavor of roasted squash. 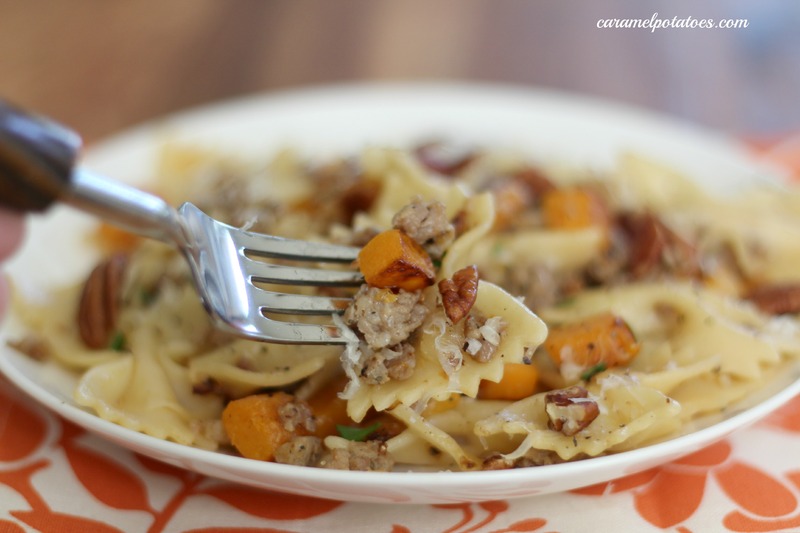 This Quick Pasta with Spicy Sausage and Butternut Squash is so full of wonderful flavor and is so easy to make. I promise – this will become a family favorite! 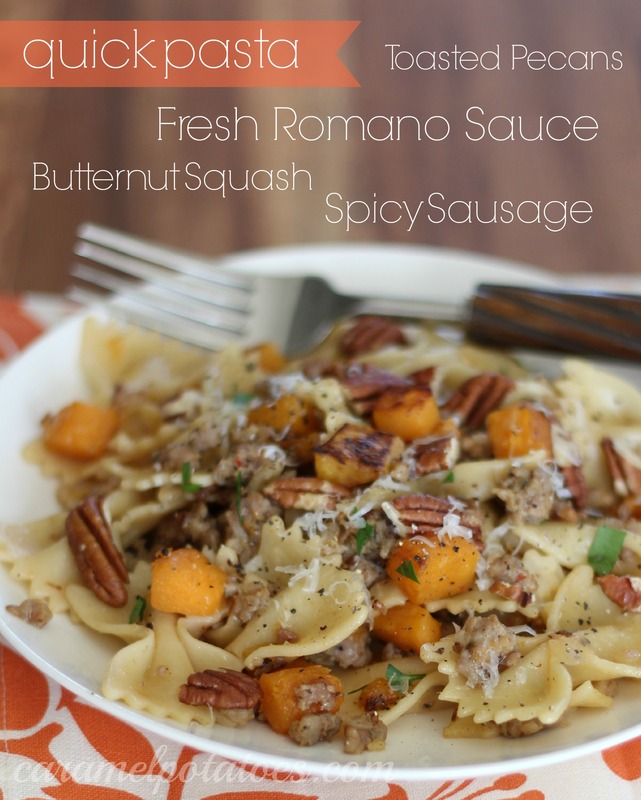 You are going to combine the pan-roasted squash with spicy sausage, pasta, and Romano cheese. Then add the crowning jewels to this masterpiece – toasted pecans. There is just nothing not to like here! If you want more squash recipes, check out this Roasted Butternut Squash Harvest Salad – the roasted squash adds and unexpected richness to this salad. You can also enjoy your squash straight up with this Baked Acorn Squash! Meanwhile, in a large pot of boiling salted water, cook the pasta until al dente. Drain the pasta, reserving 1 cup of the cooking water. Add the pasta to the skillet along with the reserved cooking water and the cheese and cook over moderately high heat, stirring, until the sauce is thick and creamy, 1 to 2 minutes. 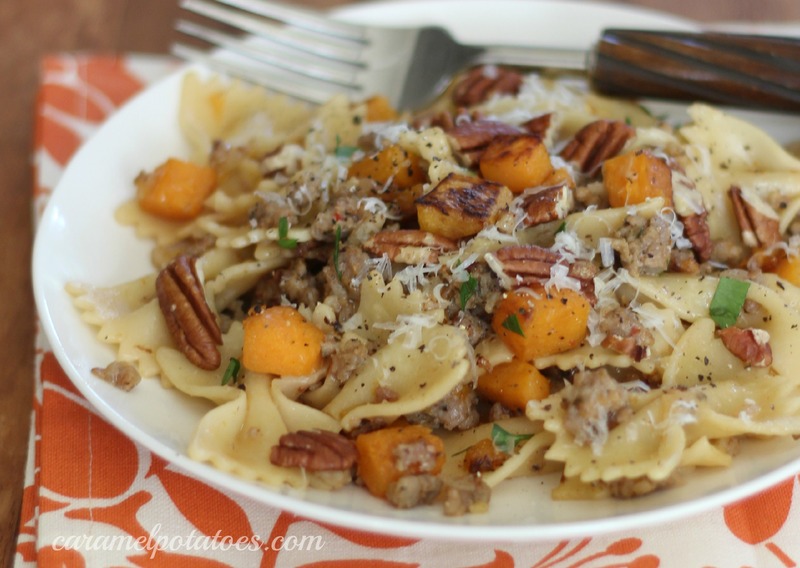 Transfer the pasta to a bowl, sprinkle with the parsley and toasted pecans. I like to add a little additional cheese on top also. Serve right away. Wow this looks so good. I am so anxious to make this! I know I will love this. Thanks. Making it this weekend. You had me with quick but then I began to drool over the ingredients. Loving this! I love everything about this dish! Sounds fancy & fabulous! 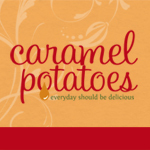 Thanks for sharing at Sweet & Savory Saturdays #29. Made this for my family and we all loved it. Even my picky eater had seconds. This is a keeper!